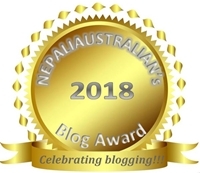 Buff (buffalo) choila is very popular with Newars in Nepal. 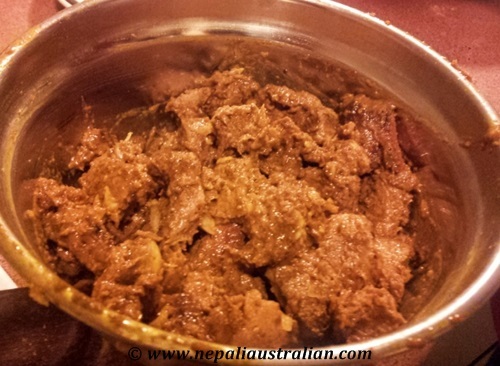 As we can’t get buff here, we make choila with lamb. Here is the recipe and it is very yummy. 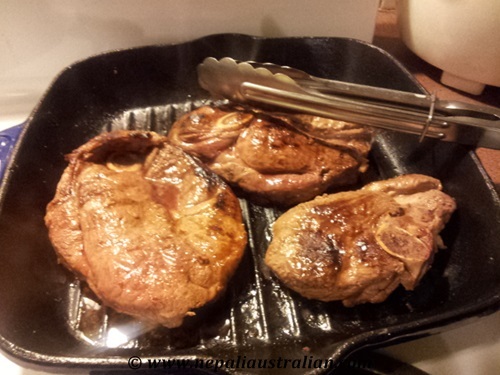 Heat a non-stick frying pan and sauté the lamb until cooked. Cook on both side and make sure, the lamb doesn’t get burnt. Once both sides are golden brown, repeat the process with all the lamb. Make sure the lam is not overcooked otherwise it will be tough and chewy. 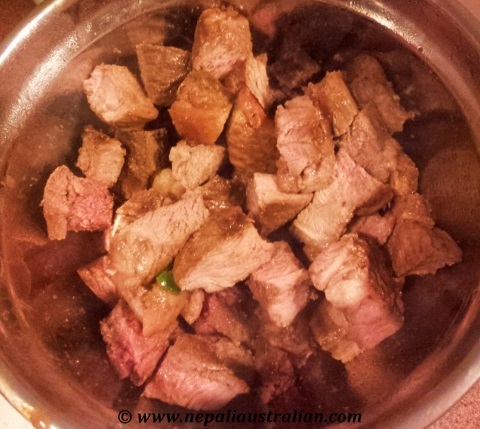 When you are doing this in batches, make sure you cover the cooked lamb in a container so it doesn’t become dry. This will also make the choila juicy and tender. Once all the meat is cooked let it cool down for a few minutes, slice the lamb into small pieces diagonally into 1 inch size pieces so it looks better for the presentation. Put all the meat in a big bowl. 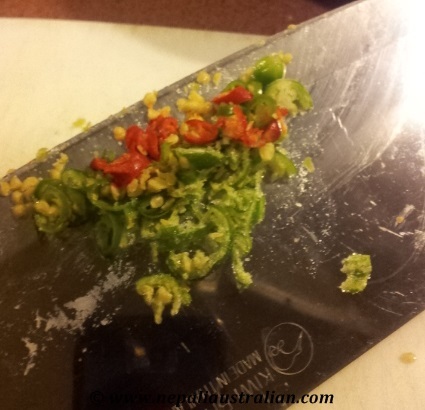 Slice fresh chilli into small pieces. 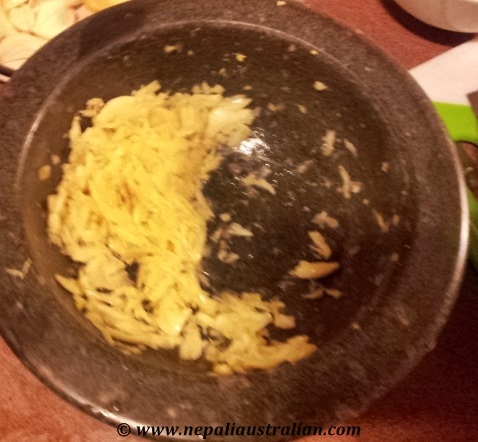 Make a paste in the pestel and mortar using fresh garlic, fresh ginger. If you don’t have fresh ginger and garlic, you can use readymade paste but fresh always tastes better. 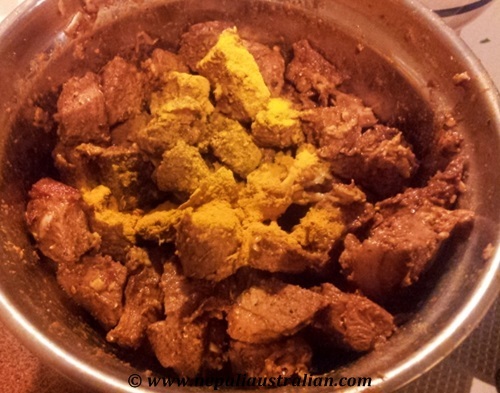 Then add this paste along with sliced fresh chilli, chili powder, cumin powder, coriander powder, chili flakes, and salt into a bowl with the lamb. Mix it well. Heat up the pan, add oil and fenugreek seeds and fry it till it turns dark brown. Make sure it doesn’t burn and turn black otherwise it will have a bitter taste. Pour the oil over the lamb and mix well. Garnish with fresh coriander and lamb choila is ready to be served! 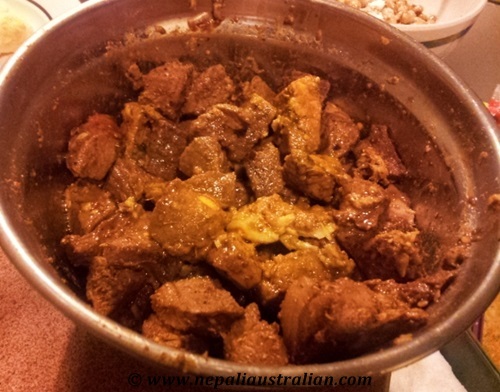 This entry was posted in Foodie, Kathmandu, Nepal, Nepali food, Newari Food, Recipe and tagged buff choila, Chicken Choila, choila, dinner, fenugreek seeds, food, lamb choila, Nepaliaustralian. Bookmark the permalink. Is Sharavan vegetarian month for you? What is the reason ? 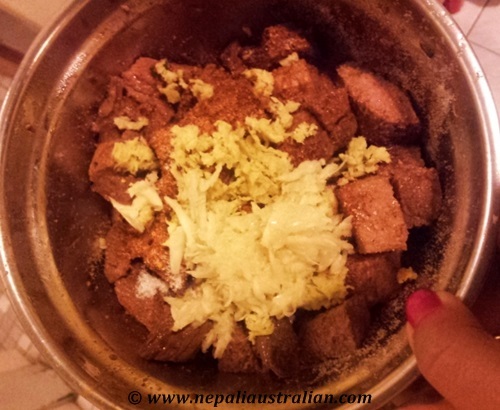 I love choila..it is my favorite Nepali food along with aloo ko achar:) best combo..and thanks for sharing how to make it! I am still trying to figure out what pakku is? I think that is Sikkim food. Explain plz gal. You should! 🙂 it’s delish!